Kala Bhairava is believed to be the fiercest diety in the whole universe and is known as the destroyer. He is described as the leading ruler of time and is beyond death. 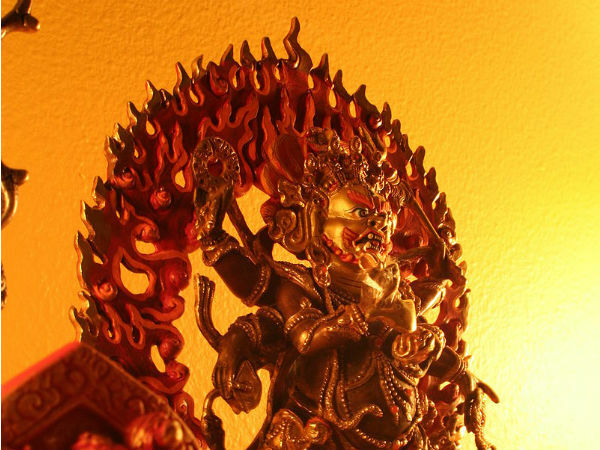 There are several legends related to the formation of Kala Bhairava. As per legends, it is said that Kal Bhairava was created by Lord Shiva himself. Hence, most of the temples dedicated to him are built near Lord Shiva temples. You can find Kala Bhairava temples all across the country. Each and every state of India has several temples dedicated to this powerful deity who has ultimate control over time and death. Being a common deity in Hinduism, Buddhism and Sikhism, he is worshipped in several other countries as well and is also known as the protector of women. So, let's learn about the Kala Bhairava temples in Karnataka which are immensely popular amongst local tourists and devotees. Located in the locality of Rajarajeshwari Nagar in the metro city of Bengaluru, Kalabhairaveshwara Temple is one of the most visited Bhairava temples. With a small gopura and a beautifully carved small idol of Kala Bhairava in the sanctum of the temple, this beautiful temple definitely deserves to be visited if you love scrutinising the architectural beauty of temples. Bidar is home to several tourist destinations including forts, temples and monuments. Kaala Bhairava Temple is one amongst these most visited places where you can find tourists as well as devotees coming from the nearby towns and localities to give their deity offerings and pay their respects. You can also visit its green surroundings which are responsible for magnifying the overall beauty of the temple. During the festive seasons, the temple is entirely crowded with devotees. Kala Bhairava Temple at Gadag is one of the most visited places in Gadag. Due to its beautiful carvings and magnificent architecture, it remains popular amongst tourists as well. Surrounded by green trees, the beautiful complex of Kala Bhairava Temple provides its visitors with the essence of calmness and serenity. Being a common deity, Kala Bhairava at Gadag is also worshipped by numerous Buddhists who come here as tourists. Even though the temple is not immensely popular, it is still visited by thousands of devotees every year. Due to its less popularity amongst tourists, Kalabhairaveshwara Temple at Jogi Mutt in the Mangaluru district is visited mostly by devotees. However, on account of its beautiful compound, it deserves to be visited at least once. Apart from worshipping the idol, you can also learn about several local legends that talk about the formation of the temple and interesting tales about Kala Bhairava.